After Apollo, Why Didn't Space Settlement Happen? image credit: NASA During the Apollo era of the 1960's and 1970's, many assumed the spectacular series of Lunar landings achieved by the U.S. would lead to the progressive development and exploitation of the Moon and eventually the rest of the solar system.1 There were even predictions that by the 1980's the U.S. would have a permanently manned Lunar base that would be a hub of space activity. Instead, Americans witnessed a withdrawal - an abandoning of many of the gains made in the short years of the space race. After making several half-million-mile round trips to the Moon in the 1970's, why would the U.S. during the subsequent three decades venture no further than low Earth orbit? In 1997, through some determined detective work, Alan Wasser, Chairman of the Space Settlement Institute, uncovered the answer. While performing research at the Lyndon B. Johnson (LBJ) Library in Austin, Texas, Mr. Wasser discovered heavily marked-out copies of classified memos and letters from the Johnson administration discussing the future direction of U.S. space policy. Under the Freedom of Information (FOI) Act, Mr. Wasser obtained copies of the unedited originals. These documents clearly show the downfall of the Apollo program resulting from a deliberate political strategy devised by State Department and National Security officials. During the space race between the Soviet Union and the U.S. in the 1960's, a driving incentive to be the first to reach the Moon was the realization that the country with the first successful manned landing might actually attempt to claim the Moon,2 much as Columbus on Spain's behalf claimed the New World when he planted a garrison there. For the U.S, that the Soviets might claim the Moon represented a serious risk to national security, because the Moon is the ultimate high ground. It was easy to imagine the Soviets setting up a Lunar military base from which munitions could be launched at the U.S.
Before the Outer Space Treaty, the compelling incentive of potentially claiming the Moon (or one's rival doing so) was a strong driving force sustaining support for the Apollo program. The Outer Space Treaty rendered that incentive void, spelling the beginning of the end of manned missions to the Moon. By the mid-1970's, the Apollo program was abandoned and humanity withdrew to the relative safety of Earth's orbit. Walt: 1. Here are two copies of the final draft of our space paper, as it is being distributed to members of the Space Council - McNamara, Webb, etc. The Vice President wishes it to be discussed at the Council. 2. It will encounter strong opposition from NASA and Ed Welsh [Secretary of the Space Council]. Nonetheless, I believe it is right, for two reasons: (a) Moving toward a more cooperative relation with the USSR in this field will reinforce our over-all policy toward the Soviets. (b) More importantly: It will save money which can go to (i) foreign aid, (ii) domestic purposes - thus mitigating the political strain of the war in Vietnam. 3. If the proposals in this memo are left to be fought out by the space marshals and their clients, we will lose. Therefore: (a) I urge you to get into the fight personally - let the Vice President, [Bob] Schultz, and others know how you feel. (b) Send a copy to someone on the domestic side of the White House staff (feel free to use this covering memo if you wish) to ensure that someone from that side, representing the constituency whose interests are most directly affected, gets into the fight. The Vietnam War is long over, and the Soviet Union has been dissolved since the 1980's, yet today we live with the consequences of these Johnson-era decisions. Many now realize it is time to look again at the Moon and other destinations. This realization is spreading throughout society, even to the highest levels of government, as evidenced by the Moon-to-Mars proposal announced by President Bush in January 2004. The President's proposal calls for manned U.S. missions returning to the Moon and going further to Mars. The momentum and broad public support for huge government expenditures on space development, generated during the 1950's and 1960's by political Cold War maneuverings, is long dead - derailed by the cost of the Vietnam War. The mission of the Space Settlement Institute and its supporters is to find ways to rekindle our society's enthusiasm for manned space missions to the Moon and even beyond. 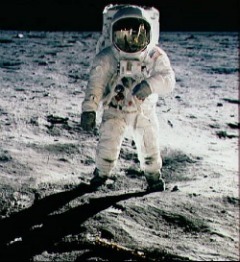 (1) After Apollo, A Colony on the Moon. by Isaac Asimov, The New York Times, May 28, 1967, 6 pages. (2) U.S. Rejects Any Flag-Planting As Legal Claim to Rule Moon. The New York Times, September 14, 1959, pages. 1,16. (3) The 1967 Outer Space Treaty. Full text of the international space treaty conceived by the Johnson Administration and signed into law by the U.S., the Soviet Union, and many other nations in 1967. Declassified cover letter and 30-page proposal sent by Henry Owen to Walt Rostrow on December 9, 1966 that began the shift of U.S. policy away from manned space exploration. Few people today realize or remember, but a single man, Lyndon Baines Johnson, "LBJ", was primarily responsible for both starting and ending "The Space Race".